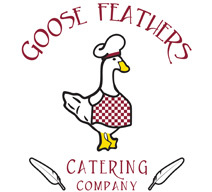 Whether you are planning a weekday office meeting, a quaint weekend get-together with friends and family, or a wedding reception, Goose Feathers is available to cater your event. Our veteran staff and our attention to detail will make any event an experience for the palate as well as the eyes. The Café’s full menu is available for any offsite catering event. 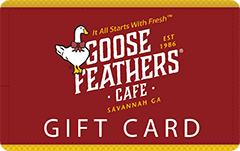 Goose Feathers Café & Bakery is also available for after hours rental for special events. We request that large catering orders be booked several days in advance, but small orders may require only one day advance notice. Goose Feathers Café & Bakery offers Catering consultation upon request. Don’t forget to place your orders for our “World Famous Bread Pudding, Quiches and our very popular Whoopie Pies. All Catering Van deliveries have a 10% surcharge (minimum $25 weekdays/$50 weekends). Van deliveries have an order minimum of $125 weekdays/ $200 weekends. There will be a 25% restocking fee for orders canceled the day of the delivery. All catering orders must be placed a minimum of 48 hours in advance. You will receive a call to confirm you order and coordinate delivery (orders placed after 2 pm will not be contacted until the following business day). For more info, give us a call at 912-233-4683 or send us comments and/or questions via our contact page. Handmade pastries require 24-48 hour notice. The Sandwiches below can be ordered individually, as a platter or as boxed lunches with chips and a cookie for $10.95 each. These can also be purchase for individual servings. Please note, the tax & total amounts do not include the delivery fee and are not final. When ordering, please note any allergen or gluten sensitivities so we may accommodate your request. Spam Protection: What is 3 + Ten?